Our little Liam was born in April of 2015. He was absolutely breathtaking. However, it didn’t take long to realize something wasn’t quite right. 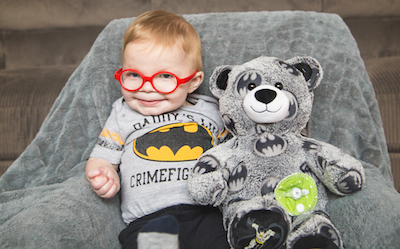 Liam had many characteristics and symptoms that coincided with a possible genetic diagnosis, including feeding difficulties, unable to gain weight, distinctive facial characteristics, undescended testicles, and not reaching his developmental milestones, to name a few. After two rounds of genetic testing we were able to determine that Liam has Alpha-Thalassemia X-Linked Intellectual Disability Syndrome (ATRX). This diagnosis came as quite a shock, partly because we had never heard of it before. His geneticist said that if they had not performed a broad spectrum genetic panel, they would have never came up with this conclusion. ATRX is pretty rare, with only a few hundred people worldwide ever diagnosed. It is believed that this syndrome is under-diagnosed, so a true frequency of it is hard to determine. Also, information about this syndrome is few and far between. So what is it? ATRX is an X-linked genetic condition that occurs due to mutations to the ATRX gene. Females are the carriers of this condition, but only males are affected. Being that this is an X-linked disorder, a mother who is a carrier has a 25% chance with each pregnancy of having a daughter who is a carrier, and a 25% chance of having a son with this condition. I am a carrier and have one son with ATRX and one son without. Liam is the first of our family’s history to have this genetic condition, so it is believed that the mutation that made me a carrier began with me. ATRX has many different clinical symptoms, and once we received the diagnosis and researched it, we were surprised to find out just how many Liam actually presented with. Unfortunately, the specific signs and symptoms that present and their severity vary greatly from person to person. Characteristics of ATRX include but are not limited to: distinctive craniofacial features (small head circumference, widely spaced eyes, short upturned nose), genital anomalies (such as undescended testicles), severe developmental delays, hypotonia (low tone), skeletal anomalies (short stature or deformities), intellectual disability, seizures, anemia, and multiple feeding, failure to thrive, or GI-related issues. Many children with this diagnosis may never walk or talk. Liam is quite vocal but unable at this time to form any legible words. We are attempting to work sign language into our daily routines, but Liam hasn’t been able to demonstrate any signs. We consider ourselves lucky to finally have a diagnosis for Liam. Although it took nine months to receive this diagnosis, we are thankful to Liam’s pediatrician for being proactive. Early intervention with physical, occupational, and speech therapy has definitely helped Liam thrive. At eight months old, Liam was not able to even hold his head up. 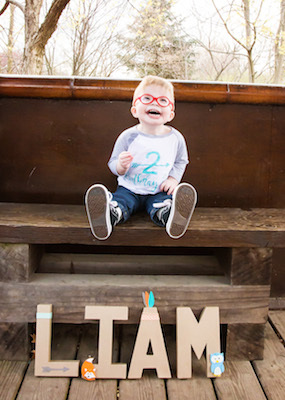 But now at two years of age, Liam is able to sit, crawl, climb up stairs, and walk with a walker, no doubt because of his early start with therapy. Besides Liam’s developmental delays, his feeding difficulties are our biggest concerns. Generally, those diagnosed with this syndrome require a special diet to ensure they can properly maintain their weight. Liam is on a high calorie diet. He gets formula that is a crazy 45 calories an ounce, in the form of bottles or in his G-tube, which was placed in October of 2016. He can eat by mouth but he is uncoordinated and not able to chew very well. His favorite foods include grilled cheese and Poptarts, as he does well with dissolvable solids. Many of the boys with ATRX drool buckets and spit up constantly, which is true for Liam as well. We are currently starting Liam on Prevacid to hopefully help with his constant spitting up. Treatment plans related to this diagnosis focus on specific symptoms present in each individual and may include multiple specialists. When your child gets diagnosed with a rare disorder, it’s HARD! Healthcare professionals are supposed to be the ones who are able to guide us through our child’s health care roadblocks, but when your child’s diagnosis is something the professionals have never heard of, you have to first educate them. Just know that you’re not alone in this battle. You know your child and how a rare diagnosis affects your child best. Trust your instincts and help spread the word on the diagnosis. Together we are strong! More information and a wonderful support group for families with children or relatives who have ATRX can be found by searching atr-X on Facebook and requesting to join the group at http://www.facebook.com/groups/163849465337/.